All of that changes when a rough-around-the-edges father moves his two boys into the old house next door. The Sloans are a family in a way Sandra has never known. The brothers won’t let her hide and soon love and passion arouse the life within her to fight off the death she sees every day. When girls in town start disappearing and Sandra becomes the next victim, she’ll learn just how far the Sloans are willing to go to save the ones they love. But something bad done for the sake of something good doesn’t make it right. Sandra might have the power to save the people in her visions, but is she willing to pay the price? 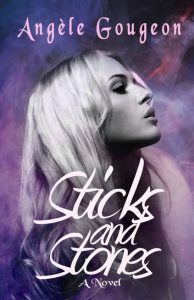 An unorthodox family brought together by a young woman’s premonitions of death, Sticks and Stones is a dark and gritty gothic romance about roads paved with good intentions.